You may have heard about two relatively new events in the Black Hills, the Tatanka 100 mountain bike race and the Black Hills 100 ultra-marathon. 2012 will be the inaugural year for the Tatanka and the second year for the run, which despite some weather-related setbacks was a resounding success in 2011. Taking advantage of the rugged and scenic Centennial Trail, and a few others in the case of the Tatanka, and being 100 miles in length these events are destined to form a reputation as some of the most challenging, even without being at elevation, but also two of the most enjoyable events in this class in North America. Yesterday I did a solo ride of the stretch of Centennial covered by these events, with a long detour through Piedmont, SD to refuel. The large section stretching south from Dalton Lake to Pilot Knob I had never been on before, so apart from a training ride it was also race reconnaissance. 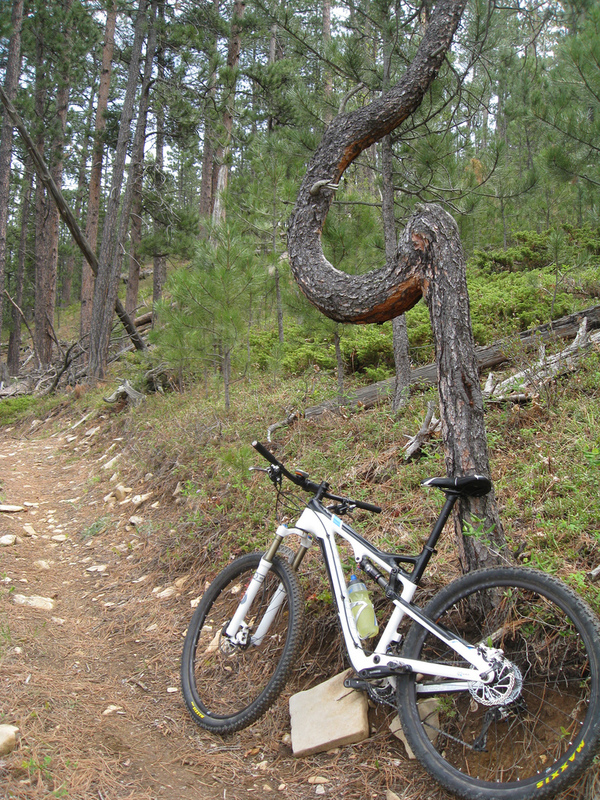 I ended up missing a turn on Trail 40 and followed an old fall line trail down to Silver City Road. Which was a bummer, but it was getting dark so probably for the best. Discounting detours my approximate time from the Sturgis City Park to Silver City was about 9 hours. This covers the first and much rougher and slower portion of the mountain bike event and puts me roughly on pace to finish the event during daylight (for some definition of daylight). I am still worried about being able to finish at all, but at least I know that it is possible. Some notes for riders: the Centennial Trail from Sturgis to Dalton is rough, definitely pass-able on a hardtail but much more pleasant on a full suspension. Continuing south past Dalton it gets even rougher and the rocks get bigger. 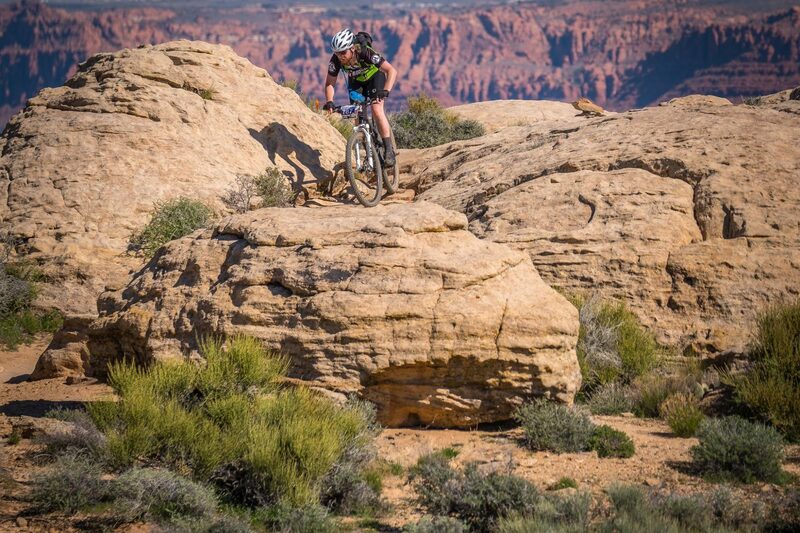 If you plan to do this event on a hardtail do yourself a favor and make it a 29er with high volume tires. 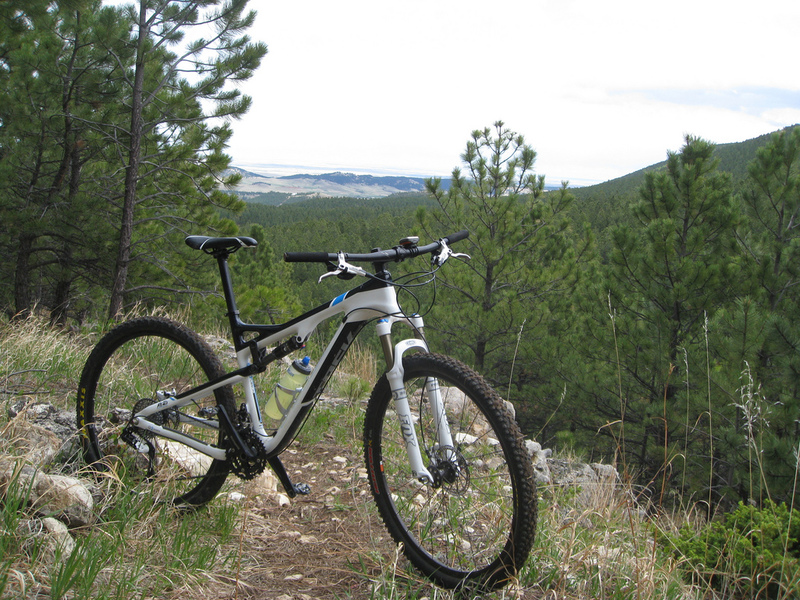 I did this ride on a Demo Trek Superfly 100, which is definitely one of the few “right” bikes for this kind of terrain. Thanks to Jesse at Rushmore Mountain Sports for letting me take her out. Trail notes: overall the Centennial is in excellent shape for this time of year. Much of it is still needle-covered, but that is something that only time (and tires, shoes and hooves), or hands with rakes or leaf-blowers will solve. There are only a handful of trees down, which should be removed soon, but they are all easy to go over or around and none are located such that one might get into trouble coming up on it at speed. Overall, it is in great condition — so get out and take advantage! A couple of photos from the Centennial between Elk Creek and Dalton Lake. A bit over a year ago in January 2011 I purchased a set of Lake MX330C SPD-compatible mountain bike shoes. They are a pretty fancy shoe, with an upper made from kangaroo leather and carbon soles as well as a BOA Technology lacing/closure system. This is not so much a review of the shoes, which are pretty good, but rather some detail about my experience with the closure system. One of the first things I noticed was that the BOA cinches up the shoe to a uniform tightness, you cannot let it be looser in the toe and tighter up top or similar as you can with a good conventional lacing system. There are shoes out now with a “dual boa” that address this but I have not found the mandated even tension to be an issue beyond some minor initial adjustment on my part. The BOA is extremely convenient, you do not realize how much so until you go back to using a pair of shoes with laces again. 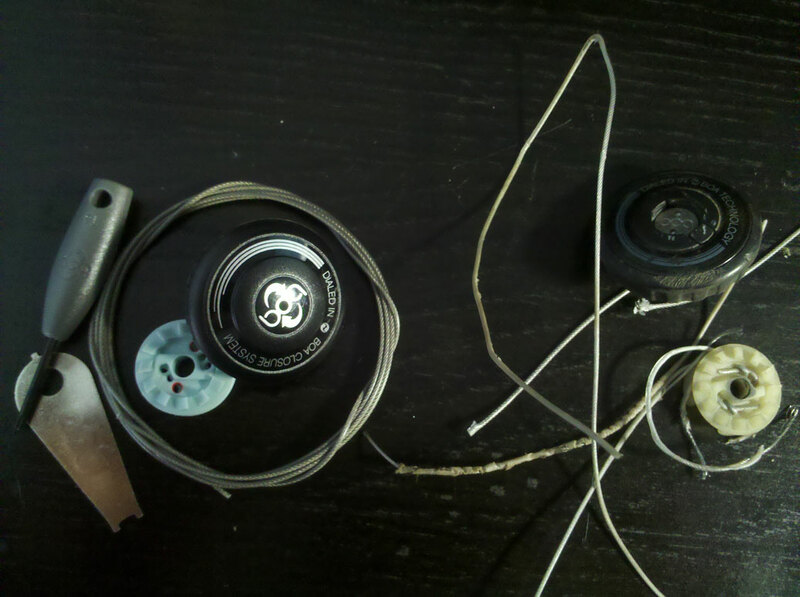 They are easy to get on (easy to put a lot of slack into the lacing system and open the tongue a long way) and take only seconds to tighten up, tightening them is not significantly faster than lacing but faster-enough to be beneficial. Taking them off really seals the deal, pop the BOA out and pull the shoe off, no muss — no fuss. The other thing I now take for granted with these shoes is the ability to make fit adjustments not just on the bike but also on the trail (those who mountain bike know what I mean, doing something on the bike while riding off-road is entirely different than just doing something on the bike). Up until a couple of month ago I would have been unable to complain about any significant downsides to this system, but it turns out there is one: maintenance. In January 2012 I was on a ride and had my first real problem with these shoes. After a ride where I was occasionally having to walk the bike through snow drifts the laces on the right shoe were “frozen” and I had trouble getting the shoe off of my foot. Unfortunately after they dried out this condition persisted and in retrospect probably was not related in any significant way to trudging through snow. Not wanting to bother with it I spent the next two months riding with a right shoe that would barely reach an adequate tightness, during this time the left shoe also began to exhibit symptoms that it was headed down this road as well. Loosening the shoe took significant more effort and felt “rough”. Finally I sent an email to the US Lake distributor about the issue and quickly received a response that BOA warranties (all boa systems have a lifetime warranty, regardless of shoe warranty) were handled directly through BOA Technology. After visting the BOA website I was quickly able to order a parts kit for both shoes completely free of charge. Expedited shipping is available for a fee, but using the free shipping I had my parts in about a week. After tearing apart one of the shoes it was immediately obvious what the problem was. 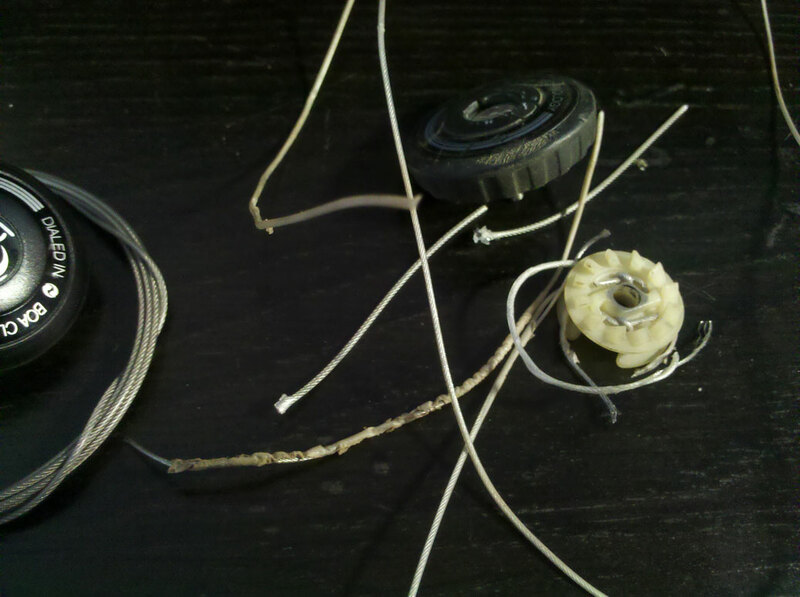 The cables (laces) are plastic-coated and that coating had become partially separated from the cable and roughed up to great extent and had wedged the cable inside one of the plastic guides of the shoe. It was not that the BOA was not working, it just could not move the cable. Replacement of the cable and ratchet mechanism was straightforward but fairly tedious. The first one took about a half hour and the second one around half that amount of time. The only tools required beyond what was provided were a pair of wire cutters (stout scissors would work in a pinch). To summarize, the system is great — better than laces in most respects. But plan on doing 30-45 minutes of somewhat tedious maintenance about once per year if you ride a lot. This timeline may be different in other shoe models, but I expect that there is probably still a maintenance requirement. So you have seen others out on the trail with their dogs wag-tagging along and/or you were thinking about taking your own furry best friend out with you, but you weren’t sure what the rules and reg’s were? Never fear, what follows are details on where specifically you are allowed to bring your dog along. Always remember, rules change and the following list is by no means comprehensive, so if in doubt please do your due diligence and pay attention to and respect any official signage or instruction you might encounter. United States Forest Service land in the Black Hills districts covers the majority of local riding terrain. Storm, Victoria, Buzzards, the Centennial, 40/40L, Big Hill, Crow Peak, Norbeck/Black Elk, Hell Canyon and Eagle Cliff trails are all on USFS managed property. 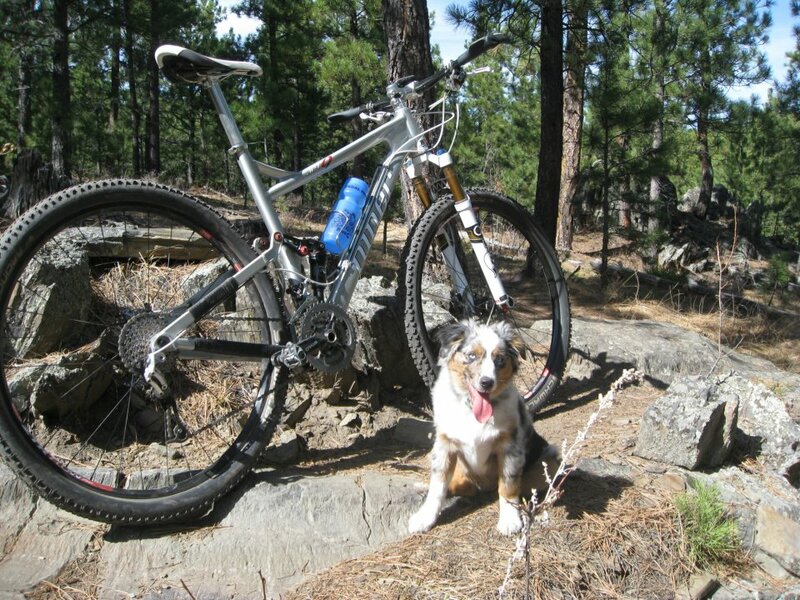 The official Forest Service rules concerning pets are, “Pets are allowed on Black Hills National Forest as long as they are on a leash or under strict voice command. Pets are not allowed at swim beaches.” These rules are detailed in brief on some of the printed literature the USFS has on offer, but I was unable to find any details on their website. Custer State Park has its own, similar set of rules. Pets are not allowed in any park buildings or on swimming beaches and when at a campground or day use area they must be leashed at all times on a leash with a length not more than 10 feet. When outside of campgrounds and day use areas they must be under strict voice control and a minimum of 200 feet away from any other park guests. All pet waste must be cleaned up and properly disposed of by the owner. Paraphrased from the SD GFP Rules & Regulations Page. Another popular area where pets are welcome but there are additional restrictions is Hanson-Larsen Memorial Park aka “M-Hill” or “Cowboy Hill” in downtown Rapid City. Pets are allowed here and the standard caveat of packing out your pets waste definitely applies, but the rules also stipulate that your pet must be leashed at all times. If you did not realize this before and you have used the trail system there, you probably just raised an eyebrow and uttered a loud “huh?”. Yes, it’s true, many users of those trails disregard the rules where this is concerned and pets are generally well-tolerated off of a leash at HLMP. That said, if you do decide to disregard their policies you may be doing so to the future detriment of all trail users. So please, pack out what your furry buddy packs in and keep him/her under strict voice control at all times. I was planning to also post places where you specifically cannot take your dog, but I could not really find any worth noting. How great is that? Leo, a 20 week old miniature australian shepherd getting his first little taste of single-track alongside a bike on the Storm Mountain trails.